One of America’s defining ideals is the idea that opportunity is available to all, regardless of where one starts on the economic ladder. The reality is that income inequality has grown dramatically since the 1970s and that increasing inequality has not been matched with growing economic mobility. Instead, the rungs on the ladder of economic advancement are being pulled further apart: in 1970, the upper-class household at the ninety-fifth percentile of income ($122,294 in 2012 constant dollars) had an income roughly three times that of the middle-class household at the fortieth percentile of income ($37,282 in 2012 constant dollars), but, by 2012, the household at the ninety-fifth percentile ($191,156) received nearly five times the income of the fortieth percentile household ($39,674). 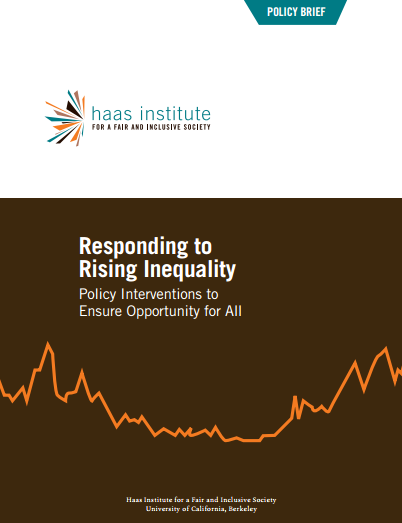 This policy brief reviews recent scholarship from members of the Economic Disparities Research Cluster of the Haas Institute for a Fair and Inclusive Society at the University of California, Berkeley and offers important insights as well as policy-based solutions in order to meet the profound challenges of income and wealth inequality and growing poverty now facing American society. Download Responding to Rising Inequality here.